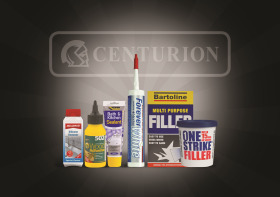 Centurion stocks a wide range of adhesives, tapes, silicones and sealants, supplying best-sellers from household names like Everbuild, 151, Mellerud and Bartoline direct to retail trade. The Adhesives and Sealants range makes up just a small part of Centurion’s offering, which have over 27,000 products suitable for a variety of retail customers. Centurion’s sales team say it is dedicated to helping identify products and ranges that will boost sales, backed by customer support and logistics that’s second to none, and if you’re looking for an effective way to display products and maximise retail space in-store, Centurion say it is also experts when it comes to merchandising solutions.